Walden regularly earns recognition for the quality of care we provide to children and families from a variety of accrediting organizations, regional public health and community-building initiatives, and the business community. A nonprofit, professional organization of over 70 licensed public and private adoption agencies committed to placing waiting children with safe, permanent, loving adoptive families; establishing ethical standards for adoption policy in California; and advocating for legislation that protects children and families. A statewide association of more than 110 private nonprofit child and family service agencies committed to providing the highest quality care and services for tens of thousands of children and their families throughout California. The members of the California Alliance share a commitment to excellence and strive to improve the quality of care and services provided to at-risk children and families. National, non-profit association that represents 400 agencies offering treatment foster care programs in nearly every U.S. state and Canadian province, reaching over 50,000 children and youth each year and a providing an array of child welfare and mental health services to over 600,000 children and youth. 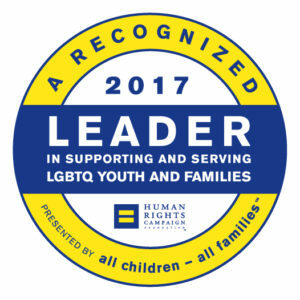 All Children–All Families recognizes agencies that meet 10 key benchmarks of LGBT cultural competency Competency – from client non-discrimination policies and inclusive agency paperwork, to staff training and creating an LGBT-inclusive agency environment to achieve safety, permanency and well-being by improving their practice with lesbian, gay, bisexual and transgender youth and families. The Children and Families Commission for San Bernardino County (First 5 San Bernardino) was created in December 1998 to realize the benefits of Proposition 10 (California Children and Families Act) for the County’s youngest residents and their families. The act created a program for the purpose of promoting, supporting, and improving the early development of children from the prenatal stage to five years of age, under the guidance of the Children and Families Commission for San Bernardino, and in collaboration with the community and agencies providing services to children. Nonprofit agencies working together to strengthen our organizations and improve outcomes for individuals and communities throughout San Bernardino County. IECC member organizations participate in a yearlong capacity building academy (CBA), including ongoing technical assistance and coaching, and have a sustainability plan which directly responds to the needs and priorities of our target audiences and local communities. Live Well San Diego involves partners in all sectors – from government, to business, to schools, to faith-based and community organizations – through a shared purpose. Working together allows for planning and implementation of innovative and creative projects to bring the Live Well San Diego vision of region that is Building Better Health, Living Safely and Thriving to life. Foster Family Agencies or FFAs are private, non-profit charitable organizations who partner with Child Welfare Services of San Diego County to find loving homes for children placed in foster care. Each FFA is unique in the age range of children they serve and the supportive services they provide, and families are encouraged to research and speak with several different FFAs in order to find the best fit. Walden Family Services is contracted by the County of San Diego and licensed by the California Department of Social Services Community Licensing Division. The leading political advocate for business, and the nexus of connections and collaboration amongst businesses in the San Diego-Baja region. Through political advocacy on the city, county, and state level we have fought to make San Diego a place where businesses can succeed and grow while creating jobs, supporting infrastructure and ensuring that neighborhoods thrive. Every child has a loving family and the ability to realize their greatest potential toward becoming a self-sufficient and productive member of their community. Supporting the lives of children and families through lasting relationships.